Trim all the dark green parts from the artichokes leaving the base and the inner, light green leaves. Slice top of leaves to about 1/2 inch above base. Cut the stem level with the base. Cook artichokes in boiling salted water with the lemon and garlic until tender, about 20 to 25 minutes. Remove from water and cool. Remove tender yellow leaves from artichokes; set aside. 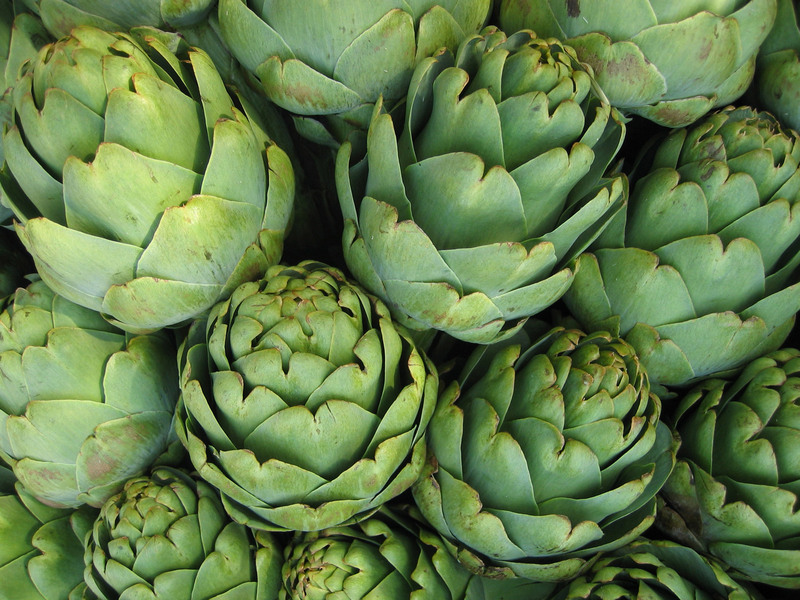 Remove and discard any purple leaves or fuzz from the center of artichokes. Slice the artichoke bottoms crosswise into three even disks. Salt and pepper artichoke disks and the reserved leaves; dredge in flour. In skillet, cook artichoke disks and leaves in hot butter or oil until golden brown. Remove from skillet and drain on paper towels. Place an artichoke disk on plate; top with layer of Mushroom Duxelle. Add another artichoke disk, another layer of Mushroom Duxelle, and top with final artichoke disk. Place one stack on each plate for an appetizer or three stacks for main dish. 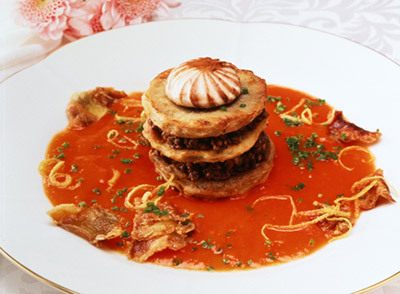 Surround stack(s) with Tomato Coulis and garnish with browned artichoke leaves, chives, lemon zest and fluted mushroom cap, as desired. Finely chop mushrooms with a knife. Heat butter in large skillet, add shallots and garlic; cook two minutes. Cook over high heat until dry. Season to taste with salt and pepper. Stir in truffle oil. In a nonreactive saucepan, heat butter. Add shallots and garlic; cook two minutes. Add wine and tomatoes. Boil rapidly until tomatoes are soft. Puree mixture and press through sieve. Return mixture to saucepan and reduce to approximately 5 cups or until mixture coats a spoon. Season to taste. Yield: Serves 24 appetizers or 8 as a main dish.